Chief Master Sgt. of the Air Force Kaleth O. Wright salutes Col. Robert Sylvester 56th Mission Support Group commander, before a meet and greet Oct. 22, 2018, at Luke Air Force Base, Ariz. Wright met with hundreds of Airmen addressing their questions and concerns about the Air Force’s future. Chief Master Sgt. 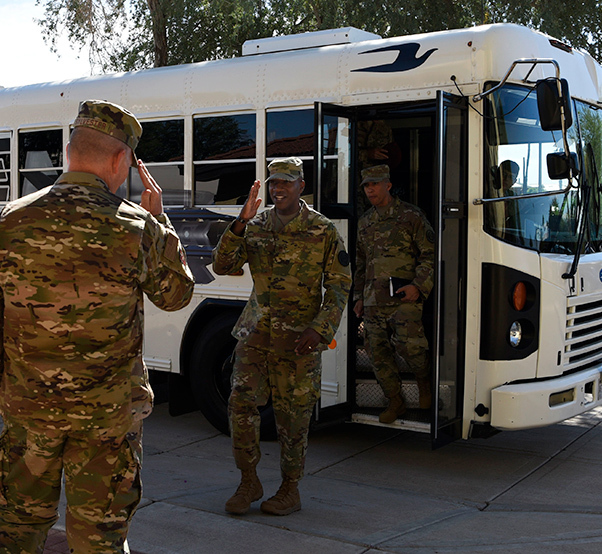 of the Air Force Kaleth O. Wright visited Luke Air Force Base, Ariz. Oct. 22, 2018, to engage with Airmen and gain insight on the wing’s mission. 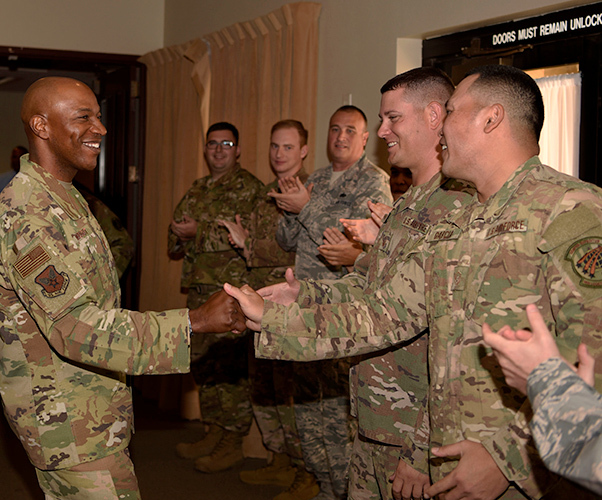 Wright visited multiple units including the 56th Medical Group, 56th Mission Support Group, 607th Air Control Squadron, 56th Maintenance Group and Base Operations. While visiting the 56th MDG, Wright stopped at stations throughout the facility to listen to Airmen and their concerns or feedback. Airmen addressed enlisted performance reports, computer based training, operational camouflage pattern uniforms and leadership standards. Wright left them with a personal story and wisdom on how to overcome their obstacles. Chief Master Sgt. of the Air Force Kaleth O. Wright meets Airmen during a meet and greet at Club 5/6, Oct. 22, 2018, at Luke Air Force Base, Ariz. Airmen from around the base gathered to listen to Wright address many topics pertinent to the future of the Air Force. As the CMSAF’s visit continued, he stopped to talk with Airmen in the 607th ACS about physical fitness, character and attitude. He spoke on developing the Air Force’s core values as part of their character and making it something that is important to them. Wright spoke on keeping oneself disciplined with physical fitness and making sure you are always ready. As the visit to Luke came to a close, the message that Wright ensured he passed on was to eliminate the phrase “that’s good enough”. Wright made sure that all of the Airmen he spoke with remembered the key message of making sure we live by the core values, especially “Excellence in all we do”. Chief Master Sgt. of the Air Force Kaleth O. Wright shakes hands with Chief Master Sgt. 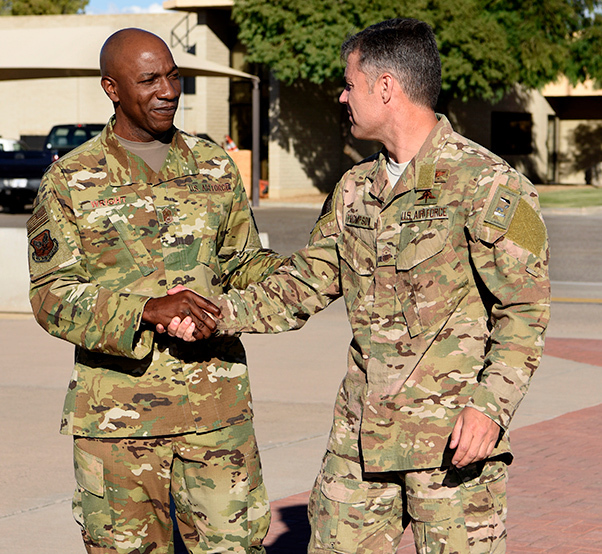 Ronald Thompson, 56th Fighter Wing command chief during a base tour Oct. 22, 2018, at Luke Air Force Base, Ariz. During the tour, Wright spent the day engaging with the men and women at Luke AFB and gaining insight on Luke’s mission.